The Danger High Voltage Slot by Big Time Gaming is a so-called Mega Ways to Win Slot. The game looks very simple at first glance, but it has some very interesting bonus features. You play here with six reels and four symbols each. An impressive 4096 Ways to Win will help you make the biggest profits. Full Wide Reels, Sticky Wilds, Gates of Hell Free Spins and High Voltage Free Spins will also help you. Danger High Voltage is fully compatible with desktop, tablet and mobile devices. The slot has a simple theme that looks pretty nostalgic. Symbols and Payouts: The symbols at the Danger High Voltage Slot are quite simple and the graphic designers at Big Time Gaming have not invested much time. There are the playing cards symbols from 9 to Ace which are the low paying symbols. 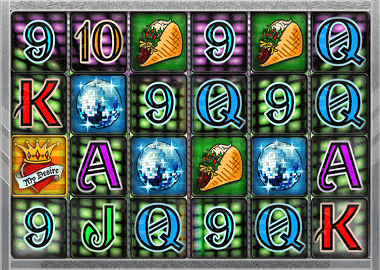 There are only 4 theme related symbols: a bell, a mirror, purple eyed skull and a taco. Most valuable symbols here is the scull which pays 25x your bet with a combination of 6 symbols. All this is pretty average, but there are still two wild symbols. These are Full Reel Wilds and they land on reels 2-5. One of the two wild symbols has a 6 times win multiplier! Both Wilds replace all other symbols on your reels and create additional winning combos. The only exception is the scatter symbol tattoo. High Voltage Free Spins: Thanks to the two bonus features, the Danger High Voltage Slot is really fun! The Gate of Hell Free Spins feature is triggered with three tattoo scatters (you will recognize it, a heart with a crown). As a result, you play at least 15 free spins with a win multiplier from 11x up to 66x! If you get another three scatter symbols, the feature will be extended by another 15 free spins! Gates of Hell Free Spins: You also trigger the Gate of Hell Free Spins with three scatter symbols. Then decide between the High Voltage Free Spins described above or the Gate of Hell Free Spins. This time you only get 7 Free Spins, but with a randomly chosen Sticky Wild symbol. Your sticky wild appears on reels two to five only, but remains there until the feature ends. With four sticky wilds on one reel you will get awarded with three extra spins. Similar slots like the Danger High Voltage are the White Rabbit or the Temple Quest slot. Free Big Time Gaming slots can you find on our Free Slots site. If you want to play the Danger High Voltage slot, just click on the banner above. For example, Big Time Gaming Casinos are Spin Rider Casino or Spinland Casino. There you will not only find a large selection of big time gaming games, but also other software developers like Microgaming or ELK Studios! Simply register and grab bonus spins and bonuses.